The “poids du roi” (King’s weighing-house) was once located in a lean-to at the back of an old wooden house at the entrance to the Rue des Cordiers, which was destroyed in 1944. Weights and measures constituted a seigniorial privilege reserved for the bishop and the town’s canons. The King’s weighing-house was established in the late 16th century. A sign indicated the duties to be paid depending on the nature of the goods. Laden carriages assembled in this part of the town which, as a consequence, was very busy, particularly before the opening of the Porte Saint-Vincent in 1709. 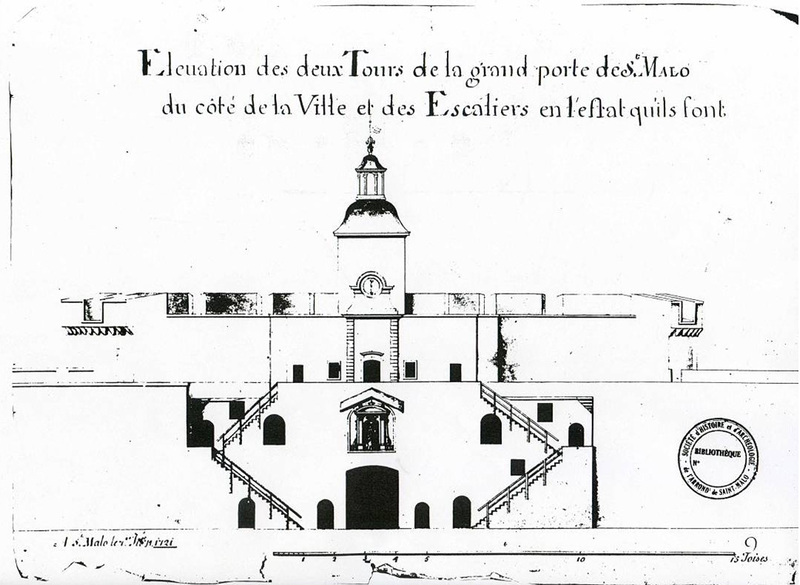 Beneath the steps on the south side of the Grand’Porte, a public fountain supplied several water troughs for horses. It was after the great fire of 1661 that destroyed 287 wooden houses in a single night that the statue of the Madonna and Child, called “Notre-Dame de la Grand’Porte” was erected above the arch of the Grand’Porte, in an old casemate. Having experienced several accidents over the next few hundred years, the original 15th-century statue was replaced in 2003 with a copy and was transferred to the cathedral. 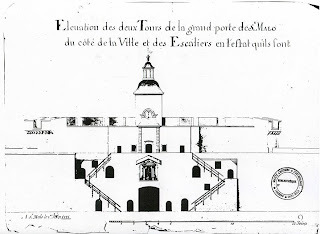 Prior to 1793, in addition to its two large circular towers (1583) and the ravelin (redan), which enabled it to be defended against an attack from the port, the Grand’Porte had a clock tower on top of it and a bell-tower containing a bell called Noguette. It was after this bell had sounded for the tenth time that the town’s guard-dogs were led out every evening and the town gates were closed behind them.